The volcano Pu’uo is pumping lava near Pahoa Town in Puna Hawaii on the east side. I wrote a song called, “Pu’uo” about the lava flow played here by my band Deep Blue. The “Uhi Uha” is a hula chant that means surround and flow and is used in hula’s about Madam Pele. Its the custom to leave M. Pele some gin to appease her. She likes gin apparently. During the last flow the TV reporter interviewed the guy who owned the first house to burn down. He was philosophical and said, “I was born naked, that’s how I’ll die. Got to leave it all behind.” When I went to visit Pahoa, the people there were all kind of in denial and acting like nothing was going on, but the lava keeps flowing on and on. Hope you like the song. Please share it. 2018 has been the best ski year of my life. I built out Van Go our Ford Transit campervan in Hawaii and shipped it to the mainland, but it was delayed three weeks by bad weather. While waiting we decided to go ski in Japan. It snowed 24 hours a day for eleven days of light fluffy powder snow…15cm a day, and it stayed at -15C. Deep and light. Japan doesn’t have long steep slopes, so its a lot of short powder laps, which works great for us. After ski, head back to the Onsen for a relaxing hot bath in volcanic heated mineral water. We stayed at Tokachidake and explored some new terrain. After we went to Asahidake and found some new lines on the backside of ridges. Both places had calm, deep, cold powder in the trees. Its becoming more crowded in Hokkaido as the word gets out world wide, but mostly Europeans, and Canadians. We only met a few Americans. We met some nice folks from Pemberton Canada who gave some some great travel ideas. 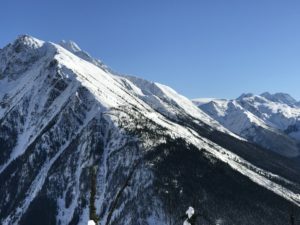 Terrace BC will be a destination this summer and next winter. We also met some Norwegians who said Lofoten is the place to go. 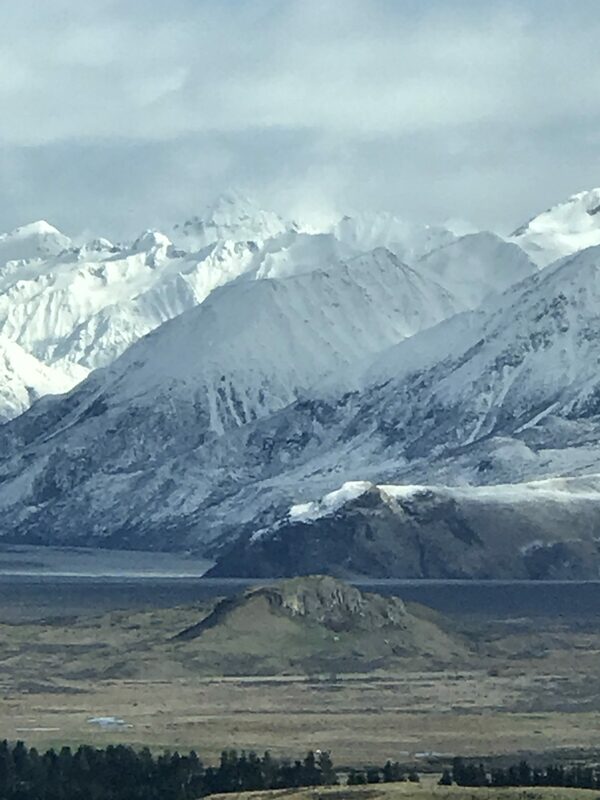 New Zealand had the best snow in over ten years. Last year we made some new friends Ash and Jane Cotter. 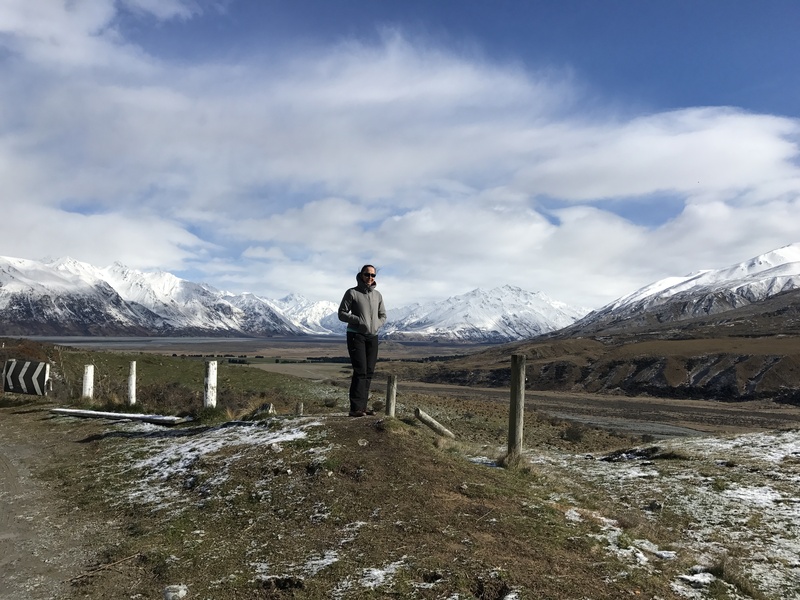 They invited us to stay at their place in Christchurch and showed us around town and the mountains. Ash is a Kiwi local and suggested the snow was deeper and better up north. Always listen to the locals! So we stayed in the Mackenzie District. Ash took me up to Mt Cheezeman where he used to be a ski patroller to hit some side country bowls. We rode the T-bar up for $10 and cut over to the chutes and bowls and scored some nice few inches of fun powder under sunny skies. We ran into his niece Lucy and her family and she is a young charger who showed us a bit on our return to the baselodge. The ski fields are fun and family oriented and a must do on a NZ ski trip. You can stay over at some of them at a lodge, but have to share washing in dishes and cleaning up. 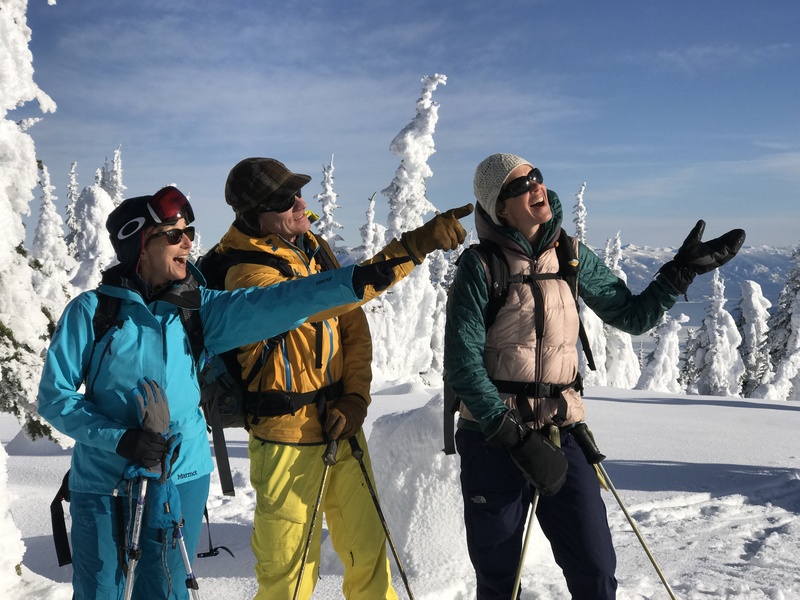 We headed to the Arrowsmith Range next and stayed at Phillip and Anne Todhunter’s beautiful Lake Heron Station in a beautifully restored ranch house with fireplace in a stunning setting. His heli is parked in the garage near the house, and he gave us a quick lift up the Cameron Valley to a little hut in BIG gnarly ski terrain. The hut has a few primitive bunks and a counter for cooking and an outhouse. Its $5 per night per person. It snowed for three days 50 cm and we were kind of stuck because of avalanche danger. We got some low angle runs, but the exposure is from 1000 meter runs from the tops. 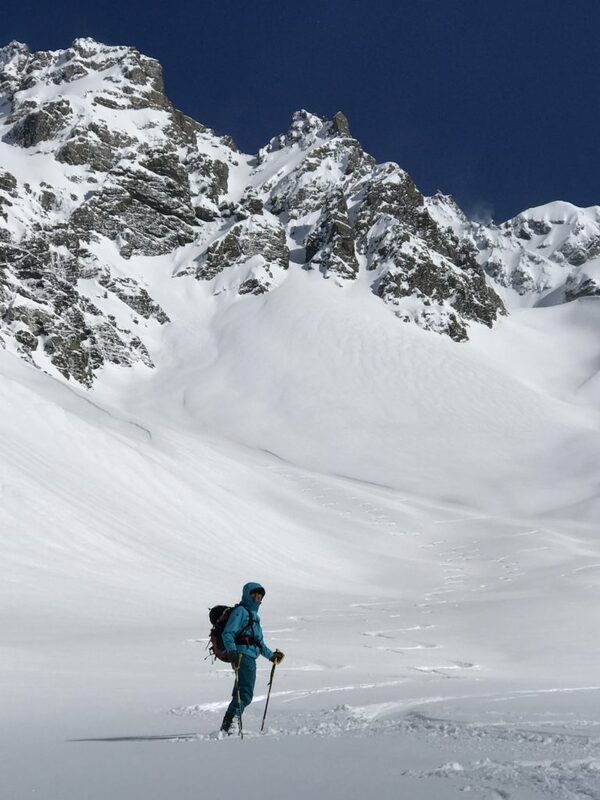 We met Arnaud Cottet and his photographer friend doing a photo shoot for his sponsor Salewa. He is an Olympic ski judge for the freestyle events. The first day was sunny and nice, but it snowed the rest of the time, so we couldn’t hit the big lines. We got out just before another storm hit and we were running out of food. We headed next to Lake Pukaki near Mt Cook and stayed in a beautiful house next to the azure blue lake. 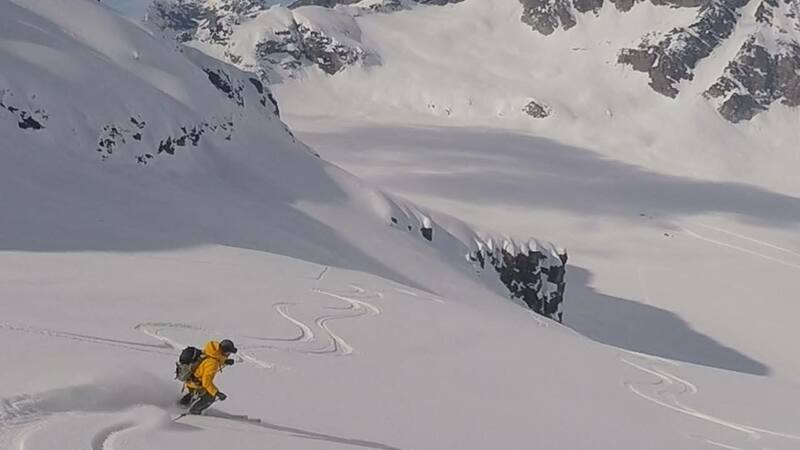 The heli base is just a few klicks ups the road, and we jumped in a heli for a 5 minute $200 heli bump up to a big bowl and glacial drainage for heli a assisted back country ski tour and skied the best powder of the trip. No one else was there. The terrain is a bit misleading because it doesn’t look that big, but it keeps going and going. The bowl was protected but we could see wind whipping by the ridges. We got three nice big runs in before the heli bumped us back out. 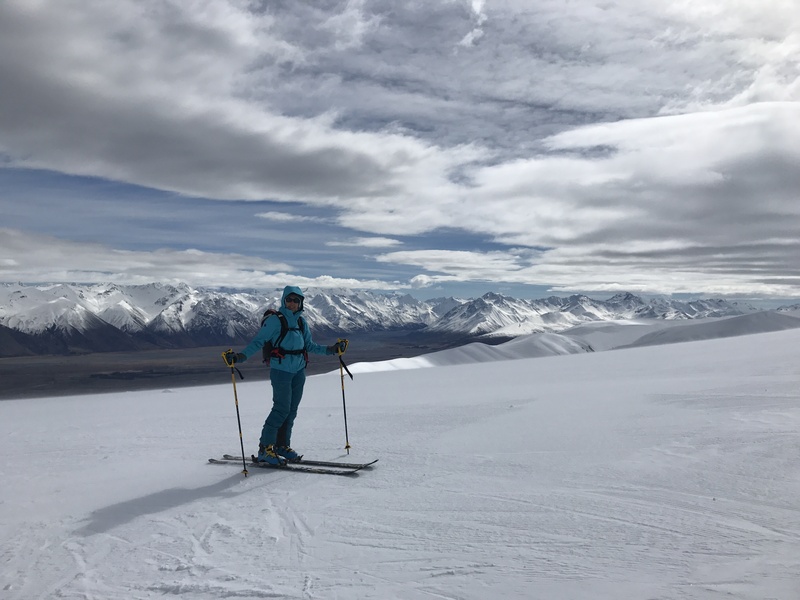 We headed back toward Lake Tekapo and went to Roundhill ski area to kite ski. The conditions were perfect with a good steady wind straight up the hill, a launch pad just next to the car parking, and flat open round hill. I finally, after a year of attempts, kite skied up the hill. I always wanted to do that. We rented a nice Mercedes Sprinter camper with shower, kitchen and toilet and heater for $30 a day. 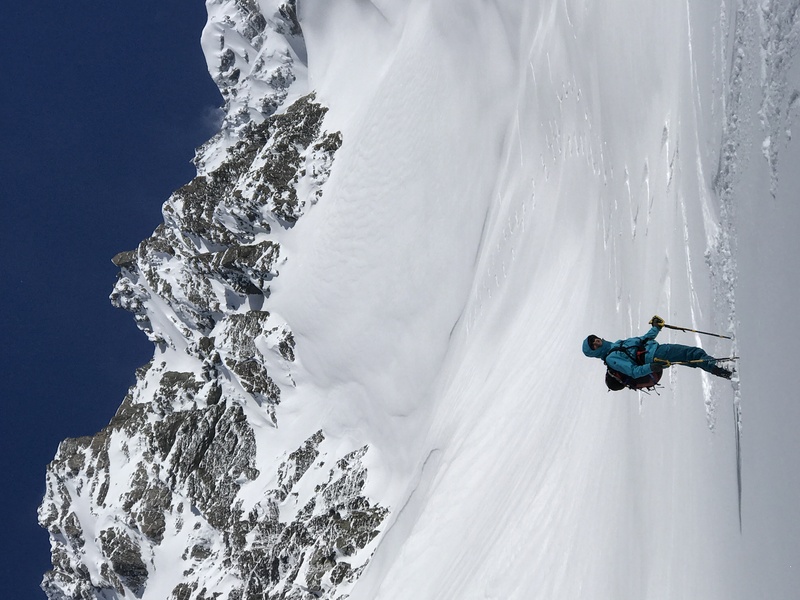 An amazing deal in low season, and a great ski base camp. I love New Zealand. Its starting to get discovered. Even five years ago, it was empty. Now there are people. Lots of Chinese. Like everywhere else, soon it will be crowded. It is the second least populated country in the world. Canada is the least crowded. That’s where I’m headed next. Stay tuned! 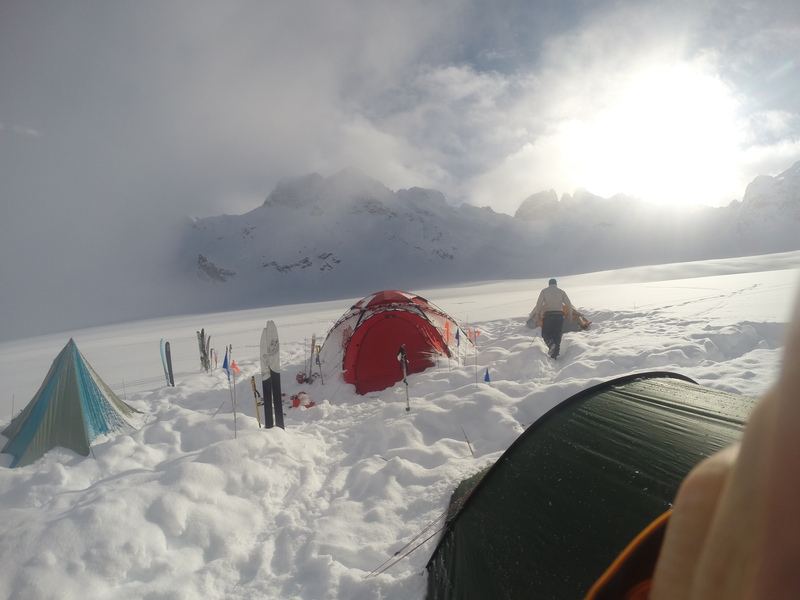 We skied and camped 20 days on the glaciers near Denali. It was clear, calm and very cold. We found the good snow. You had to know where to look. Alaska had arctic conditions and snow pack with temps down to -27C at night on -16C during the day. At that temperature, the snow recycles into sugary powder. There were only 2 other people in the entire Alaska Range. We have a 17 foot Hilleberg Atlas with a full liner, floor and vestibule which provides us all the comforts of home in style and comfort. We have a heater, built in snow furniture, tables, oven, stoves, music, movies, solar panel. We eat Shabu shabu, Beef Stoganoff, fresh baked bread, bagels, cookies, scones, Halibut and Salmon in Beurre Blanc sauce. Our first camp was at Backside Lake, a low elevation lake at the end of the Backside Glacier. A couple of local Alaskan friends had suggested it, and you should always listen to the locals. It turned out great because it was protected and calm when the rest of the Range had big wind. It was cold: between -20 and 4F, but sunny. After ten days, we went to Anchorage to recuperate and reprovision. Staying at Airbnb’s worked great because we had a washing machine, garage, and space to dry out the tents. It really changes the whole expedition. Next we took Leighan’s suggestion that Little Switzerland, on Pika might be protected and it worked out great. Leighan is a pilot with Talkeetna Air Taxi and a skier and former climbing guide. She is awesome and has helped us out with beta on the conditions in the range. It took us a day to find the goods, but the snow was great. We explored over the passes into the next valley and found a great zone which we named Shangri-La. 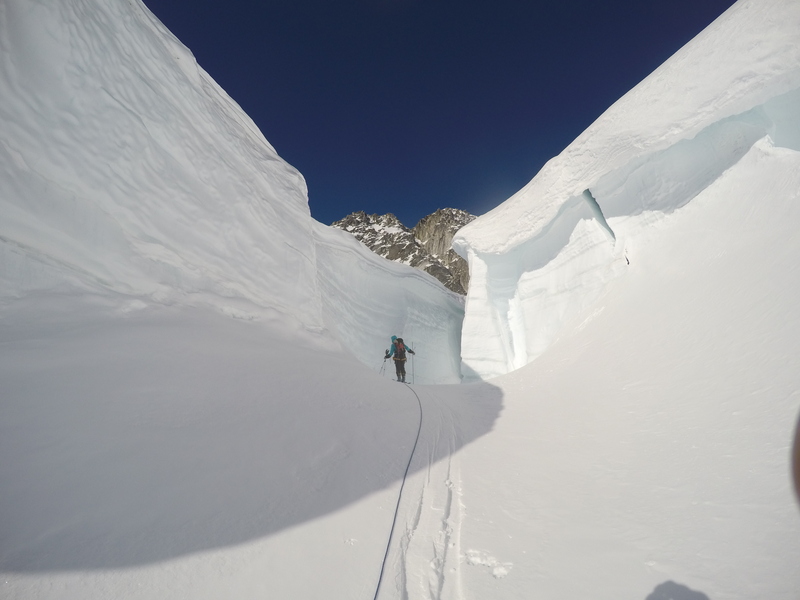 Trying to get back home from Shangri-La Valley over the pass we were blocked by this massive crevasse and a huge serac. 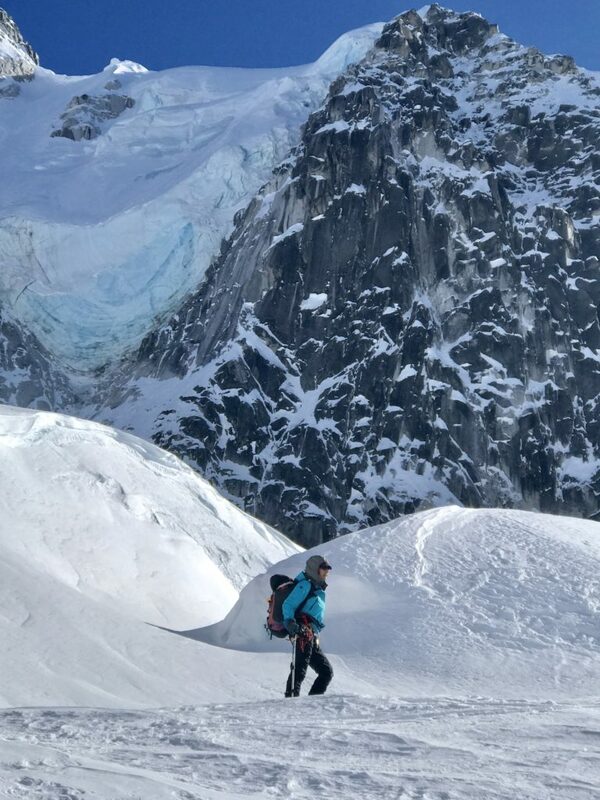 The Alaska Range has the best skiing of any place in the world. There is no where you can make 60 turns in perfect snow, straight fall line, with no bumps, changes in pitch just steps from your camp. We explored cool crevasses. Sarah is roped up and probing to avoid falling in a hole. I have to acknowledge our good friends in Alaska without whom we could not undertake these expeditions. Mike and Dayna Corey who we’ve known for 35 years lent us their giant Chevy Suburban for a month. Its a perfect expedition car, its huge, and we filled it to the gills. Our friend Stu Brown helps us store some of our gear which can’t be carried on the plane or shipped and helps us prepare. Our new friend Joe Stock helps us with beta and advice. 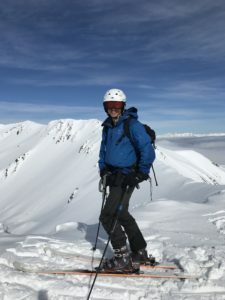 He is a famous AMGA/IFMGA guide and wrote the book Alaska Factor, which is the definitive guide to backcountry skiing in Alaska. We often see him up on the glaciers with his clients. Also our friend Aaron Brown, who wrote the book, Chuting Valdez is a valuable resource for beta and advice. Thanks guys! Its great to hang out with you in Anchorage at the great restaurants. We skied for 24 days in British Columbia, Canada, January-February 2017 and hit the weather just right: cold temperatures through three snow cycles with steady snow. The result was cold, dry, deep powder. 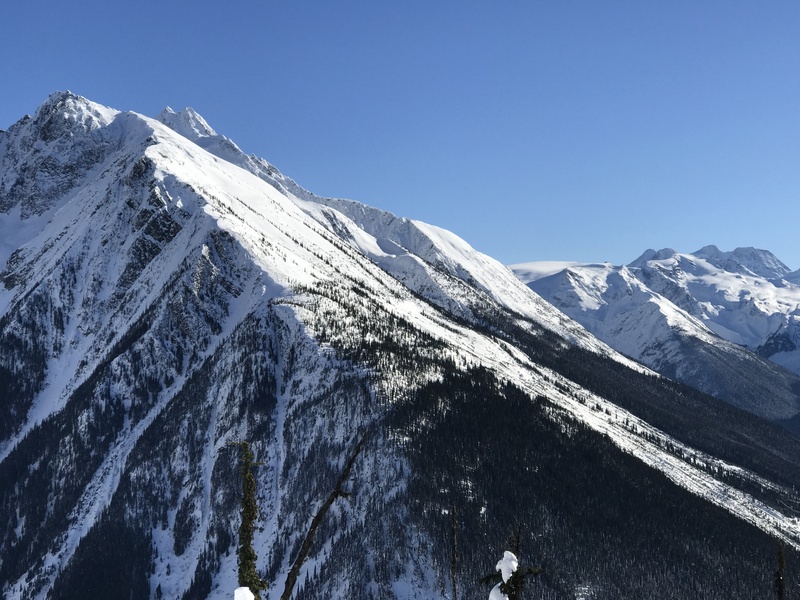 We traveled the “Powder Highway” through the Goat, Kootenay, and Selkirk ranges and the Canadian Rockies. After flying into Spokane, Washington, we headed to Sandpoint Idaho and met up with our friends MoonVapour and Dream Catcher and stayed at their cool backcountry off grid place on Mt. Baldy. They used a snow machine to tow up the roads to access the bottom of the runs. We skinned up under sunny blue skies in -15 C weather to find cold, dry powder in open fields, and on the north side, a shaded glade we dubbed, “Dark Side of the Moon”. You had to keep moving, but it was cold and deep back there. Upon returning to their home, we had a wonderful meal of hot soup, and a soak in their wood fired hot tub next to a creek under a starry sky. It felt so good! We jammed and played music. Chris and Liz have been perfecting their ukulele duets and vocals and I really enjoyed playing with them. BC is a great place. Canada is the most uncrowded country in the world with only 4 persons per square kilometer. The roads were empty and it was easy to find places to stay through Airbnb. The Canadian dollar was at $.75 so everything was a great deal. The Canadians are mellow and friendly. People say “hi” just walking down the street! When you walk into a restaurant, other diners greet you and say, “Good Morning”! We headed up to Nelson next and skied at Ymir Lodge ymirbackcountrylodge.com above Nelson. You heli in about 10 minutes and get out at treeline and really nice terrain. 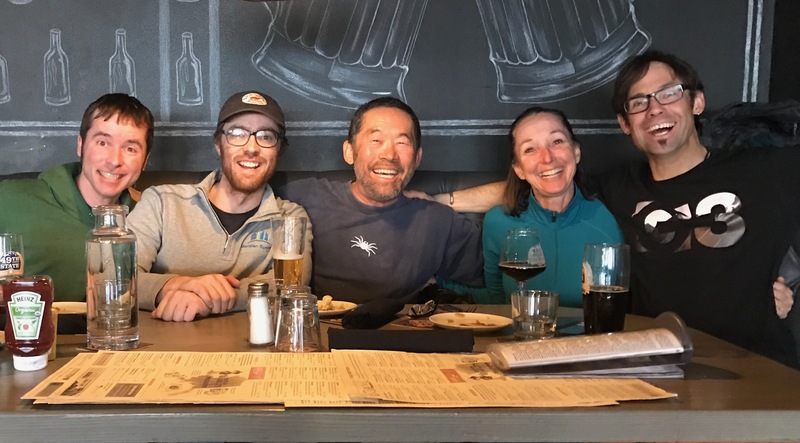 We met some folks from Anchorage Alaska that we had met several years before out on the Denali Glaciers and had a nice connection. Brian, the hut caretaker, is a voluble, friendly hardworking Canadian from Jasper and we struck up a friendship with him Trevor, who owns the lodge, recalled some of our adventures getting to Ymir Yurts years ago when the snowcat fell off the road and we had to dig it out. 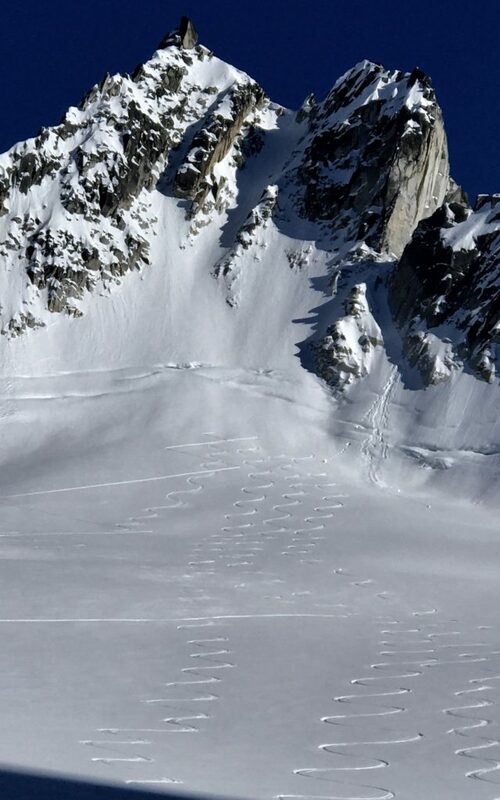 There had been a big snow event and the avalanche danger was high, so everyone dialed it back. The next day was cold and clear, and the snow settled nicely and great snow was everywhere. The next morning, the Alaskans were due to fly out and wanted to get a last morning run, but the temperature had gone up and the avy situation had gone bad. Unfortunately three of them got caught in a big avalanche and one girl was killed. It was a traumatic and emotional hit for everyone involved and for all at the lodge. We felt so bad for her parents. We helped with the rescue and it had a huge impact on us. Then we headed to Nakusp and skied with Rod, friends of Moon Vapour and Dream Catcher. He lives in the woods and takes skiers out on snow machines and tours in the Goat Range. Its a long day riding, climbing and skiing. Rod is 65 years old and can climb 2000 meters a day, has a thirty year old girl friend and is very strong. After two days of that we were beat and retreated to Nelson for a couple rest days. Then back to Ymir Lodge for a few more days of nice sunny pow. After that we headed up to Rogers Pass which is awesome, intimidating, and really really steep. Big lines, as big as it gets. We edged our way slowly into the lines and scored some epic powder days. One day right after a big cold storm we skied waist deep blower powder. One of the best days ever. We stayed in a little tiny ski cabin near Blaeberry. We also stayed with our friends Andreas and Suzanne who have a beautiful new modern ski cabin with the latest European technology and design nestled next to huge dramatic mountains. We stayed till the weather turned warm and headed down to our daughter’s baby shower in Berkeley California and met up with our son, and his new wife. Some old friends were there and the nice weekend wrapped up one of our best trips ever. Now we’re prepping to head back to Alaska and camp on the glaciers. When you are out in the wilderness your life depends on good gear. Also when gear fails, you want your gear fixed or replaced. When you are leaving for a trip, there are always last minute gear purchases. Good customer service is very important. Also when we go to Alaska and the thermometer hits -20F you need good down pads. I always use Exped Downmat 9 LW. Its super warm and as comfortable as my bed at home while in my tent on the Alaska Range glaciers. They also have great customer service and repair and replace products if there is the rare problem, even after years of service. I used to like Arcteryx. I’ve had problems with the taped seams unraveling. When I sent my goods in for warranty recently, they lost the garments, but also lost the records of the warranty! Their customer service needs some reorganization. I’ve started using Outdoor Research gear and will be reviewing some of their gear here soon. You can tell their gear is designed by backcountry skiers. It has the specs you need, such as lots of pockets. Their prices are more reasonable as well. We skied Antarctica in November 2016 for 12 days. It was our third trip there with Ice Axe Expeditions aboard the Sea Adventurer. 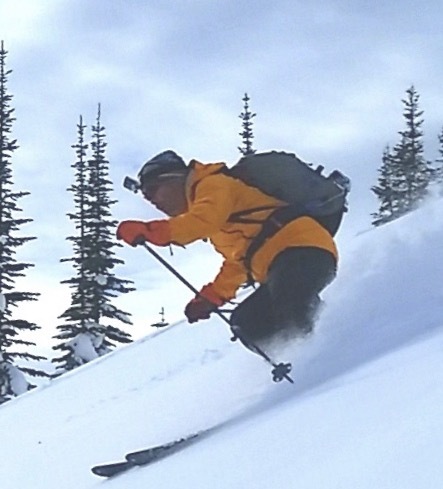 Doug Stoup has been running the ski expedition for seven years. We climb up the mountains and ski down. We live aboard the ship and are treated to gourmet delicious sit down dinners, big breakfasts with bagels, lox, omlettes, coffee, fruits, bacon, sausage, eggs, beans. We had calm sunny weather on five of the seven days skiing. The Drake Channel crossing was perfectly calm, and none of the 100mph winds and 40 foot seas of last year. We met interesting, beautiful and athletic people from eighteen countries. The guides are movie stars, and famous athletes. We traveled sixteen thousand miles for five days from Hawaii to get there, and it was worth it. I’d love to spend more time down there. The sound track is from my new recording release Wai ili kahi and Puuo by my band Deep Blue. New Zealand, South Island, is the most beautiful country, almost the least crowded, and certainly the most friendly country in the world. We had a wonderful month long trip in August 2016 and met some wonderful new friends and revisited old friends. It is the quintessential Surf and Ski land where you can ski big snow covered peaks and surf perfect surf breaks the next day. The very first day we arrived, we bumped into a friend we knew from Antarctica, Mark Sedon, and he said the heli skiing is epic. The first day we did 20,000 feet vert in nice powder, but had very sore legs. Then we headed up to Kirtle Burn hut near Mt. Pisa to ski, We met an Aussie group of snow kiters. Geoff Wilson kited across Antarctica! They let me try and connected me with Richard Prout, the kite distributor who connected me with a guy getting rid of some kites. I am now learning snow kiting. Richard Prout turned out to be an interesting guy and we had dinner and some drinks. He turned me on to Bald Hills Pinot 2005, 2006 and 2010. The 05 is one of the best wines I have ever had in my entire life. One of the highlights of the trip. We helied into the Liebig Range and stayed a week at the Lady Emily Hut, which is NOT on the map and only used by locals. We met a group that had met in Antarctica and ran the safety and housekeeping for the Kiwi base in Antarctica. Talk about interesting jobs! The terrain and snow was very good with big bowls and towering peaks and chutes on all aspects. We then stayed at a beautiful hut next to Lake Pukaki. Just up the road the heli guys lets us bump up 6 minutes to a big mountain Kai Terau just above them. The price was less than skiing at the ski fields. Heli assisted back country skiing. Its a big big bowl with 2500 meter peaks. We scored perfect corn and sunny weather. We skied 20 days out of 30 and only had 2 weather days. We rented really nice houses in Wanaka. I’d definitely think of living there more. Friends Alex Magoon my best friends son from Hawaii, and Leroy Rust came up from Duneden to ski with us one day. We went down to visit my good friend Rod Rust in Duneden. He has a big ranch above one the best surf spots in the world and owns a surf shop. Rod’s son, Leroy is also a big wave surfer we met when he was surf big waves in Hawaii and helped with our daughter’s wedding. We surfed some fun waves at St. Clair’s in front of the surf shop in Duneden. Unfortunately, its getting discovered. Wanaka, a charming little ski town is starting to get crowded. Even four years ago, its was deserted. Queenstown is overrun. There are buses of Chinese tourists yelling loudly in gaudy clothes. The back country huts are crowded. Even still, the roads are virtually empty, and there are many places to get away with a one hour hike. Nothing like the crowds in California or Washington. Here is the movie of our ski mountaineering and glacier camp trip to the Alaska Range, Denali National Park April 2016. 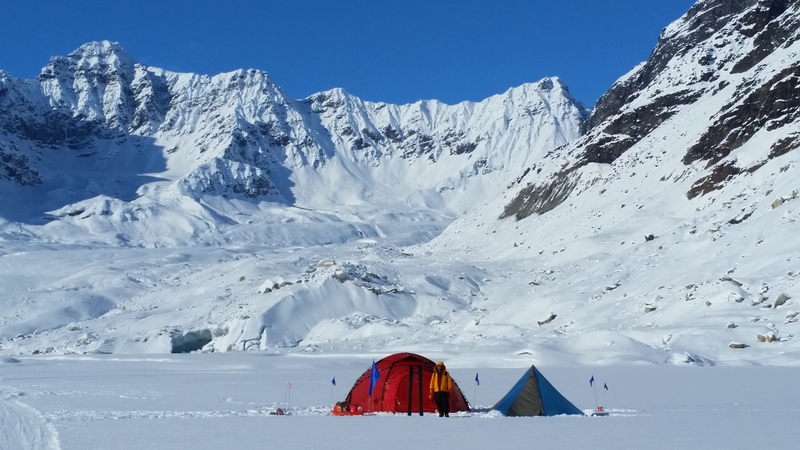 Six things you need to camp in comfort and style on the high glaciers in the big Alaskan Mountains. The Hilleberg Atlas tent with the floorless liner, the floor and the vestibule is a great set up for living big. The tent is spacious, warm, and sturdy. We built snow furniture inside with plywood tables and nice beds. A kerosene heater keeps the -20F temperature comfortable inside. It’s necessary to dry out gloves, and warm up boots in the morning. It burns Jet A fuel which we get at the airport in Talkeetna before flying in. The Coleman Camp oven goes right on top of the Coleman stove or the MSR Whisperlites. We baked bread, bagels, tart tintin, Pear Tart. Plywood tables go on top of snow tables for comfortable living. Kids foamy floor blocks for the floor of the snow help keep your feet warm. We even brought a toilet seat! It eases one of the harder jobs on the glacier. We also brought a Megmid tent for the water closet and it really pays off on a snowy windy day. We had perfect sunny calm weather with one snow day to refresh the snow. The snow corned up the last two days and we could explore the surrounding valleys and glacier bottom. Paul Roderick of Talkeetna Air Taxi and Pilot Leighan Falley took good care of us and steered us in the right direction. I trust them, and that is worth more than anything. I love the Alaska Range. It is the best skiing anywhere in the world. I’ve been all over. Sarah and I took the direct flight from Kona to Anchorage leaving at 9:30 am and arriving at 4 pm. Just a perfect schedule. We went out to a nice dinner with Stu and his girlfriend Kelly at an trendy Anchorage restaurant. The women were attractive, slim and hair styled. That’s a first. Stu Brown, Matt, Sarah and I planned to fly in to the Talkeetna Range to ski and glacier camp in March 2016, but when we arrived at Talkeetna airport, Paul Roderick, the famous owner and pilot of Talkeetna Air Taxi said the snow was no good but he had a nice place in the Alaska Range they had been skiing. You ALWAYS listen to pilot Paul. So we changed plans. 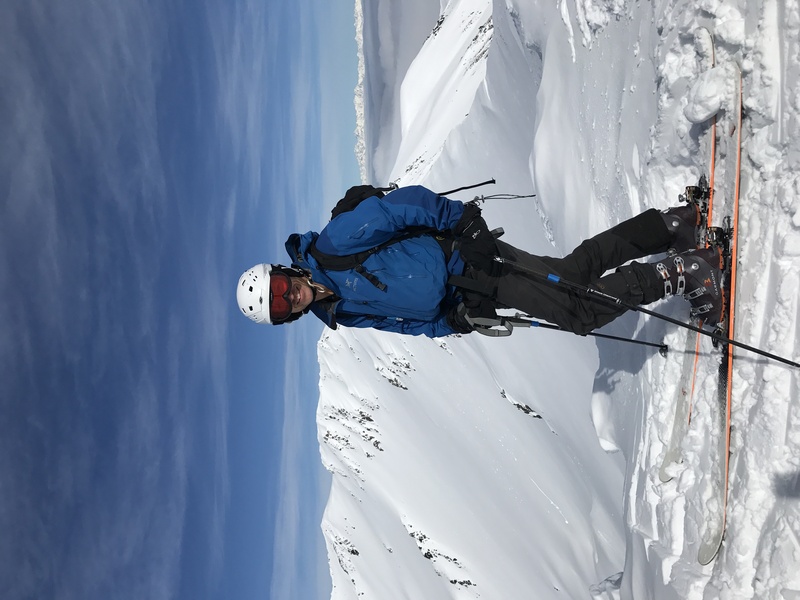 Leighan Falley, our pilot, outstanding skiier, avalanche safety expert, and an extremely attractive and pleasant young woman, expertly flew us in in the Beaver ski plane out of Talkeetna into the wild Alaska Range on a beautiful sunny calm day. I had the best trip of my life, and the best skiing I’ve ever done. Thanks Paul and Leighan for the suggestions, flying and support! Talkeenta Air Taxi is the best! We set up the usual pimped out “glamping” set up with the 17 foot Hilleburg Atlas with liner and vestibule with 4 burners, a large 4×4 checkered covered center island dining table and full bench seating all around. We had our separate Hilleburg Namatj 3 GT tent. We had a full kerosene heater and a Mr Buddy propane heater to warm up the sleep tent in the AM. We had a separate BD Megalite for the WC. Deluxe. The temperature was about 10F, calm, with light fluffy powder that smoked. We had an entire drainage to ourselves, and were the only people in the entire Alaska Range that week. After a few days of calm sunny pow, it snowed about a foot of blower fluff. We even skiied at midnight in the moonlight. Another pilot and Leighan came in with some girls from Talkeetna for a ski, and again a few days later to camp, and they stopped by one evening to hang out at our Bar and Grille. The last day of skiing was one of the best days of my entire life. Stu and Matt had to leave, and the crew at TAT told us a big storm was coming in, so we packed up and took off a few days early. It was a big storm that dumped a foot in Anchorage. As far as I know, I invented the separate tent for the WC, and have the most glamorous camp set up in Alaska!